As Squareflair is in the process of churning out custom V6 sites, we've learned to focus a great deal on the mobile experience. Yah, so... our own mobile-awesome Squareflair V6 redesign is waiting in the wings. We hope to launch it someday soon, but our clients come first! 2. Give customers a phone number to call. 3. Give customers clear driving directions. 4. DO ALL OF THIS FOR MOBILE VISITORS. While building the latest Squarespace restaurant site for DeLullo's Trattoria ( delullositaliancom ), and testing on mobile, I came-up with a cool trick: to place the phone number in the site's navigation. Along with placing the phone number a little lower within the site, there's no way the number will be missed by visitors. To do this on Squarespace was actually pretty tricky, but only because I had to add a script/hack to the default link action that the menu applied. 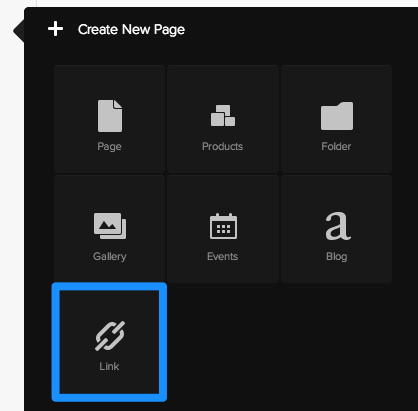 Add the phone number to the menu by using the create a new page menu function, and selecting the LINK icon. Fill-in the Configure Link name field (and only the name field) with the phone number. I added a little extra human messaging to keep things friendly. What happens at this point, without extra scripting, is sort-of odd. On non-mobile/touch device (a notebook/desktop), the link refreshes the page. On mobile, nothing happens. —so onward with the script! The link element we added above is actually using the class ".external-link", and since we want to trigger an auto-dial from a mobile device, we can inspect the code and see that at a smaller size, also known in Responsive Design circles as a "mobile breakpoint", we can see the class ".mobile-nav" is being used in the main menu area of the site. This really should do the trick. If you have questions, just give a shout in the comments below. As of now (5/9/2012 is when I first noticed), when making any change on any page the user gets a prompt to save changes. If you don't "save", the user get's an alert — a last chance opportunity to save or cancel changes. We've relaunched our Squarespace podcast! This season, we're using Google Hangout so you can get a good look at our faces, so maybe it's less-podcast'y and more-embarrasing'y. Your three favorite Squarespace fans are back with a brand new invention and the season three premiere of Content, Structure & Style, a video podcast dedicated to the Squarespace web publishing platform. In this episode we heard what Alan Houser , Brandon Davenport, and Josh Braaten have been up to since season two of the unofficial Squarespace podcast, explored what's new in the world of Squarespace, and started to dive into a hands-on migration for ContentStructureStyle.com from Squarespace v5 to Squarespace 6. This video was originally broadcasted via Google+ Hangout on Air at 7:00 p.m. CDT (8:00 p.m. EDT, 5:00 p.m. PDT) on April 18, 2013.